I've been up since 6 and have already done everything I could think of doing. I've taken a shower, the laundry is finished, the kneazle box has been cleaned out, all my owls have been checked and replied to, and all important muggle sites have been gone through, replied to, and read. So I'm doing the last of the Week 1 camp games. 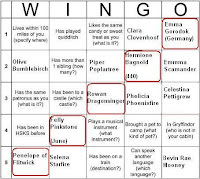 Anywho, here is my Wingo. In other news, I have just realized that my work desk as been taken over by yarn. It's not just one skein or ball or even hank...it's 7 balls/skeins. And three different sets of circs. I'm surrounded! And I swear the green and silver for my Slytherin socks keeps moving toward my mouse in the night when I sleep. There is just no other explanation for it, because every morning I have to move one of the green balls off to the side. I supposed I could just move all the projects into the small laundry basket my mother gave me...but then I wouldn't have anything to knit that was close at hand. Choices, choices. Well...at least my coaster for my coffee mug hasn't been eaten...so I'm happy. I think I'll work on those sneaky slithering socks. Maybe the yarn is just telling me I have deadline. *pets yarn fondly* So well trained.